Some of the very best wood for woodturning is grown right here in the USA. Domestic woods are not only the most affordable, in many cases they are the most enjoyable woods to turn as they are partially seasoned and contain enough moisture to turn quickly and easily. Some of the domestic turning blanks we offer include Myrtlewood, Silver Maple, Holly, Mesquite, Yew and Ash to name a few. 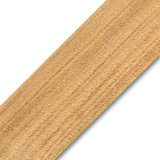 Whether you’re looking for bowl turning blanks or spindle stock, we have beautiful domestic wood turning blanks for you.